On a high-flying adventure with Gnomeo and Juliet to solve the case of the missing gnomes, and protecting your own garden gnome collection at the same time, you will absolutely love our newest Sherlock Gnomes Garden Statue! We�re thrilled to offer the Officially Licensed Gnomeo & Juliet line of garden statues, including Sherlock Gnomes! Sculpted just like the character in the movie, this hand-painted garden gnome is made of cast poly-stone resin and stands solid on his own patch of grass, and arrives ready to protect and serve. 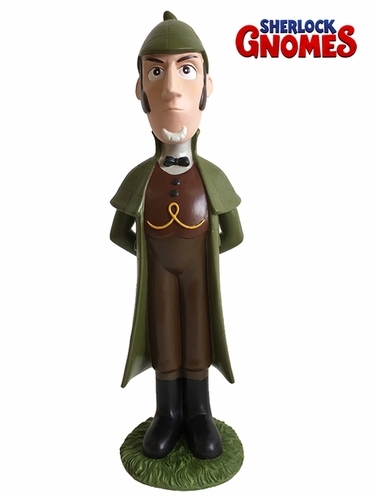 Who is this "greatest ornamental detective" hired by Gnomeo and Juliet to solve the mystery of the disappearing gnomes? Of course, it's the one and only Sherlock Gnomes. Now you can purchase and enjoy him too in your own home garden! Children, adults, and fans of all ages will love our Sherlock Gnomes, for sale only at GardenFun.com. Complete your Gnomeo & Juliet garden statue collection and protect the whole bunch of them, and others with our favorite new Sherlock Gnomes! Sherlock Gnomes is 14" in size. Cast Poly-Stone Resin for added durability. Hand Painted. Officially Licensed.